When EventPrinter first starts, it displays a pre-filled stub template you can modify and edit to suit your event. 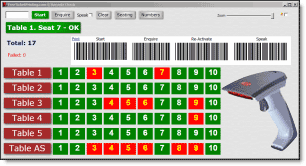 The ticket body area is a blank template with just the ticket number. To re-use ticket designs for later Events, design 'Base' Templates by adding text blocks and images (logos etc), leaving out text and/or images relevant to individual Events (dates, Ticket prices etc) and save as background image templates. Or just design backgrounds, borders etc that can be easily saved and re-loaded as Templates. Re-load these Templates for later events, and add relevant text and images to create new tickets from the saved template 'Base' designs. Click Search for Backgrounds to find available background images for your ticket templates. Once you've found an image you want (and have permission to use), right click it and choose Copy. Now right click in the ticket designer and choose Paste Image or Paste Image Background. 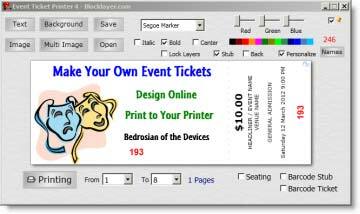 With 'Paste Image Background' you can choose to stretch the image to fill the entire ticket area (including stub) or just the ticket, and set it as the background. Paste Image will paste the image at its original aspect ratio (width vs height) in the position you clicked. To resize, position and stretch the image after 'Paste Image', click and drag it to the center (or close) of the ticket area. Now roll your mouse-wheel to resize, hold down the left CTRL key or left SHIFT key and roll your mouse-wheel to stretch the image width and height to fit the ticket area as required. Right click the image again, choose Opacity and select between 10% to 100% to change the background image opacity. When it's as you want it (size, aspect, opacity, position etc) right click again and choose Save Background to set and save the image as a background. Hit F1 for Key Combinations to add background colors and gradients to your Templates. You can create templates in any image editor and load them into the designer as backgrounds. Create full size ticket background images (including stub background) at 508px * 192px (or same aspect ratio), and ticket only (no stub background) at 356px * 192px. You can load any image (at any size or aspect ratio) as a background, and it will re-size and stretch to fit the ticket area.